Though we love our summers here in West Michigan, autumn comes in a close second. 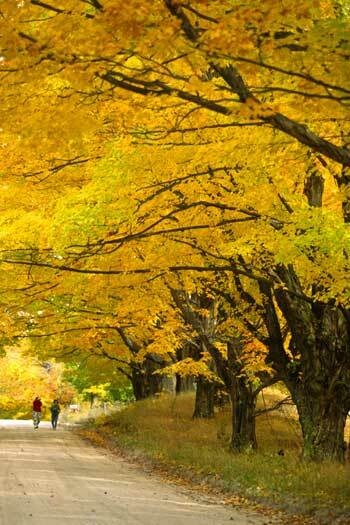 What's not to love about the thousands of trees that proudly display their vivid yellows, oranges, and reds. The crispness in the air feels so refreshing, and beckons you outside to enjoy a walk through the woods or a leisurely stroll along the lakeshore. Temperatures greatly affect fall color. When days are sunny and warm in autumn, the colors turn a vibrant red and orange. Cloudier days will produce leaves with more yellows and browns. 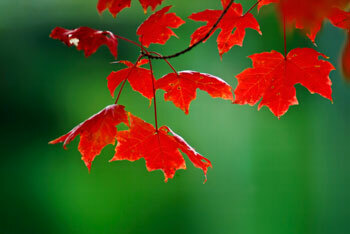 You can begin to see color sprouting on various maples and oaks, with many of the trees maintaining their green color. 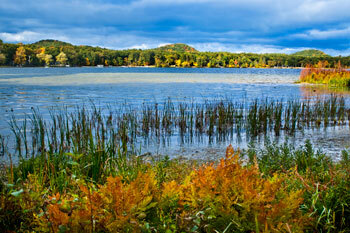 The Upper Peninsula will start to see color change. Fall colors inland in the Lower Peninsula peak around this time, but the trees along the Lake Michigan shoreline will not be as colorful. The last of the trees in the Lower Peninsula along the lakeshore will be peaking in the last two weeks of October. Fall also brings its own unique entertainment--from Harvest Festivals and hayrides to corn mazes and barn dances. This is the season to visit a pumpkin patch, enjoy the goodness of fresh apple cider, or book a charter for some terrific salmon fishing. Residents head to the local football fields for that exciting Friday night showdown. Downtown West Michigan businesses in places like Ludington, Arcadia, Bear Lake and Onekama display their "Scarecrows on Parade," and you'll find them both funny and creative. Grab a warm cup of coffee or a bowl of soup at one of the area restaurants, where the friendly staff always makes you feel welcome. In this part of Michigan, along the Lake Michigan shoreline, the colors are most vivid from mid-late October. Temperature, soil moisture and sunlight play a major part in when the trees begin turning. Abundant sunlight means earlier color. Heavy winds and rain will drop leaves before they turn color. Perfect conditions are a growing season with ample moisture, a dry and cool autumn, followed by warm days and cool nights. Mason County is especially beautiful in the fall. Plan on attending Ludington's Octoberfest and Haunted Fairgrounds in October. Restaurants and shops are open and ready to greet you with great bargains and warm meals. A bit further south in Oceana County, you'll truly appreciate the beauty of fall in the back roads, where fruit fields come alive with spectacular color. Pentwater has its Art and Crafts Festival in late September, with Oktoberfest and Spooktacular Weekend in October. Stop into one of Pentwater's dining establishments for a warm drink and gear up for some shopping in their downtown region. 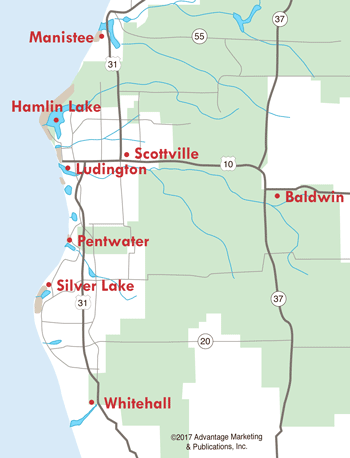 Manistee, Benzie, and Leelanau counties are home to the famous M-22 route, over 100 miles that travel along Lake Michigan. This is easily one of the most beautiful drives in Michigan, and a must-see in the fall. The canopy of trees and the low traffic make for such a relaxing day drive. The communities along M-22 welcome you into their shops and restaurants...with perhaps some bargains and great prices! For more information, read our story about the M-22 Color Tour. The West Michigan area is truly blessed with four seasons, and fall is the most colorful of all! This quieter tourism season may be one of the best-kept secrets of travelers who enjoy less traffic and great travel discounts at lodging facilities in Ludington, Manistee, Pentwater, Silver Lake and other West Michigan communities. The air is crisp and clean, so come on--snuggle into your sweatshirt and enjoy what Mother Nature brings us, year after year.